I've been looking for a powerful headlamp mainly for all-night (actually a couple nights) Alpine ultra trail running. Now I've found it: Lumonite Compass R. Yes, I'm a sucker for simple design - guilty as charged. I don't want any bells and whistles like computer software to program the light. I also don't like external battery packs. Just minimalist functionalism and nothing more. 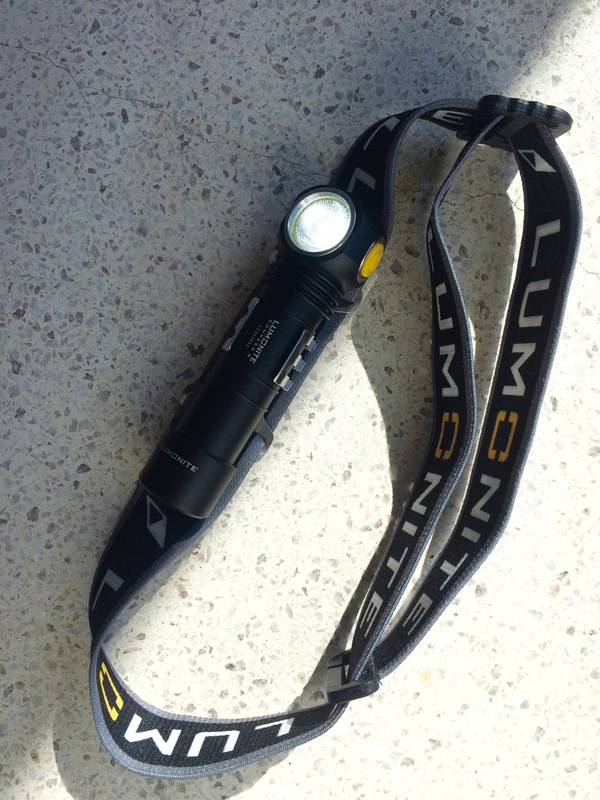 Lumonite Compass R with headband and battery inside: simple all-in-one design. the powerful Cree XM-L2 CW led can be dangerous - for security do not leave anything in front of the light within 5cm when turned on, slightly turn the battery cover open when not in use to avoid it turning on, don't let kids play with the light and never point the light directly into eyes. Midnight test: competing with the full moon! The beam lights up the trail ahead clearly. I've briefly tested Lumonite Compass R at midnight and the results seemed very good. 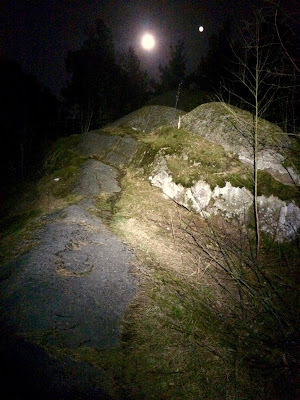 The beam lighted up the trails and boulders ahead nicely. The final test will be Swiss Irontrail T201 in August. Will according to the manufacturer it's 24 hours / 8 hours / 2:50 hours depending on which brightness level you choose. I plan to use the medium level (230 lumen) mostly for trailrunning, so it will last one whole night (8 hours). For the other night I'll take another battery. In easier situations the low level might be sufficient. In difficult conditions the high level might be necessary. We'll see how it performs in real races later!